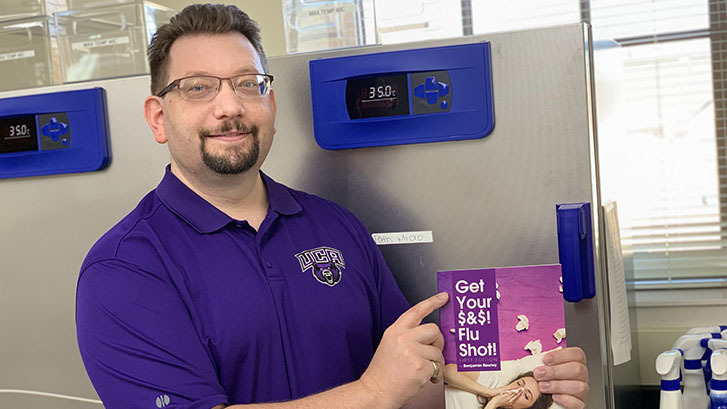 Dr. Ben Rowley, associate professor of biology, has written a book with scientific information on the personal and societal benefits of influenza vaccinations. The book, titled Get Your $&$! Flu Shot, addresses the confusion and myths surrounding flu vaccines and vaccines in general, and it simplifies the science behind both the virus and the vaccine. It confronts misconceptions about vaccinations and helps readers understand why they are safer than is often understood. Written from a biomedical perspective, Get Your $&$! Flu Shot! is intended to serve as an adjunct text for courses in microbiology, immunology, and virology. It is also a useful addition to introductory biology courses. Rowley earned a Ph.D. in microbiology and immunology from the Lewis Katz School of Medicine at Temple University in Philadelphia, Pennsylvania, and then went on to serve as a post-doctoral fellow at the Fox Chase Cancer Center in Philadelphia. Rowley teaches courses in general biology, microbiology and immunology. In addition to teaching, Rowley sits on the advisory committee to the departmental chair and advises undergraduate and graduate student research. His most recent publications include co-authoring “A Retrospective Epidemiological Study of Influenza Pandemics in Arkansas,” which appeared in the Journal of the Arkansas Academy of Science.